In arguably the biggest announcement I’ll ever make on this site, Ferrari arrives to Tomica!!! 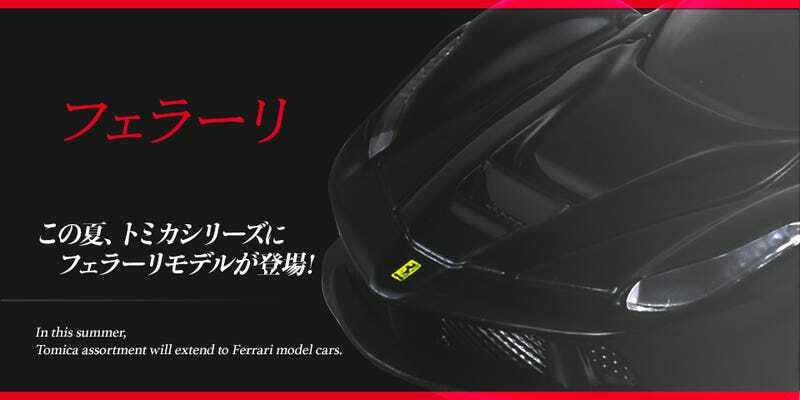 Coming August in Japan, the motherfu_____ LaFerrari (one swear allowed in a PG site) will be on a Tomica basic box and shall be seen in stores soon! This is an immense bombshell development, not the least because this is the first new Ferrari on Tomica in a long time. And the screams of “Grazie ragazzi!” don’t stop there! The good ol’ Testarossa will make a debut on the Premium line. A bit weird to do this re-debut for the brand this way, but I’m not complaining. Especially if you get a Tomica World Ferrari dealer building! Now you can turn down potential buyers, roll back tachometers and spin to your heart’s content as you line up your Ferrari collection to this dealer. It looks so good as to be almost professional, so it wouldn’t look strange in photos. There are many more releases in August but really, they all but fade in the background. Ferrari is here, and here to stay for a while.